Jake contacted me earlier this week and said he had a Halloween costume in mind that required a bald head and could I help him. I referred him to the Mainstage Theater Supplies store downtown where he got the necessary bald head appliances (2), greasepaint & powder, spirit gum glue, and tools (makeup sponges, brushes, powder brush). In my college theater back ground I had done a lot makeup-wise but had never done a full bald head. (I'd done aging, scars, "wiping out" eyebrows, etc. Small stuff.) So I asked if we could do a test run the night before. Add to this that Jake had to be at work at Autozone at 7:15AM Halloween morning, and then had a shift at his manager job at Walmart's that afternoon. 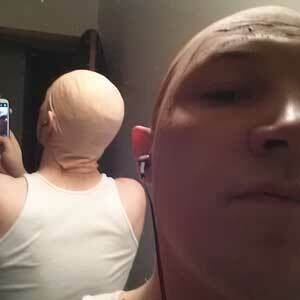 Then he planned to go out partying with his friends -- all in costume. So the timing for it all was very tight. Jake drove over to our Area 51 flat on Saturday morning, arriving at 4:45AM! I had a big scrambled eggs & bacon & toast (with Earl Grey tea) ready for him. While he ate, I got things set up. This video of professional artists pretty much shows what we did, with minor alterations as this was not for a stage production. The 2 final touches for Jake's character -- who was a clone -- was that Agent 47 has blue eyes and a bar code tattooed on the back of his head. Jake had gotten blue contacts - which looked super (and really weird since we are used to seeing him with brown eyes!). The plan for printing out a copy of the bar code onto onion skin paper and then spirit-gumming it to his head didn't work when the printer could not handle the thin paper. By this time Jake was running late for his job! 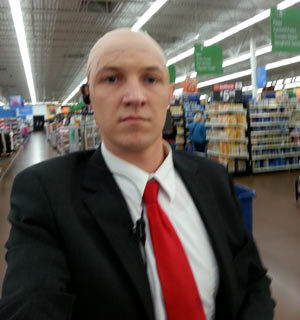 So I used the dark liner pencil that came with the makeup kit and, using a small pad of Post-Its as a ruler, hand-drew a bar code with the numbers onto his head, including Agent 47's number. Needless to say, Jake and I had a lot of fun not just creating things but pulling it off in such a short time frame! Went over to Walmart and was greeted by laughter. 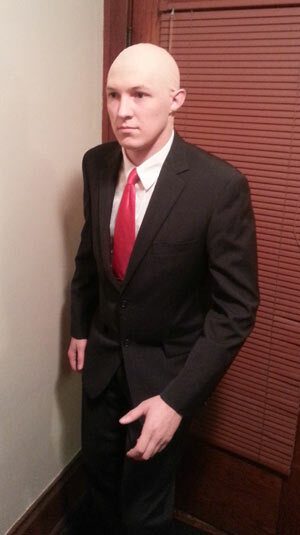 About half the people working there thought I was someone from corporate, the other half was chuckling at my head. But by about 3 it calmed and I started getting a lot of customers recognizing who I was and saying that it was an awesome costume. It was the bar code on the back that really made the costume. There were a lot of people that didn't get it until I turned and showed it to them. Unfortunately I did not really have a chance to keep up on the makeup and it had faded to a fair bit lighter than my skin. 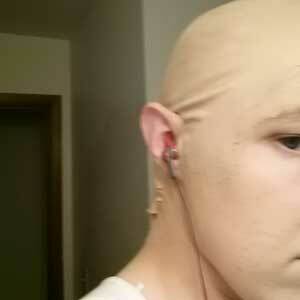 The latex also started stretching and wrinkling. I put another coat of paint on the cap and now it's close again. All in all it was pretty fun. Now I have to top this next year. 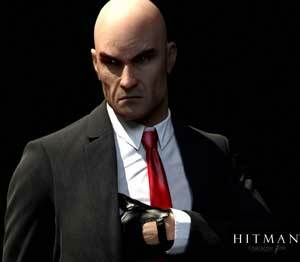 Here are some images of the character Agent 47 from the video game Hitman. Jake adds: I should also mention that Agent 47 is a clone of 5 of the world's most dangerous criminals and does jobs for the company that made him. 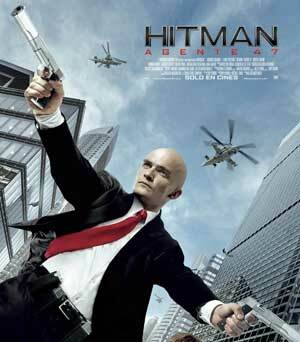 Jess answered the phone once with "Agent 47" and gave me the idea through that.